Radio Ballad No 8 - Parker, MacColl, Seeger, etc. In the week that I received this album to review, my first grandchild was born - in a trailer on a travellers' site. This brought a new poignancy to a work for which I have always had the highest regard, especially as one of the first themes is birth, in the track beginning "Born in the middle of the afternoon ..."
I have been able to listen to all eight of the Radio Ballads released or re-released in this series - a couple I have heard for the first time - and there is no doubt that I have been allocated the brightest jewel in a very considerable crown to review ... only Singing the Fishing comes near this majesty. Yet it is also the most uncomfortable of the series to listen to. The people who would take any sort of interest at all in The Radio Ballads would be unlikely to have problems with the celebration of labour, of the miners, the fishermen, the road builders, the railwaymen, the unsung heroes of our industrial heritage. The seasonal and temporary work that the Travellers did is rightly celebrated here, but at root this programme is about blind prejudice in our society. This affects us all and should make us feel ashamed. Yes, I've got quite a lot of traveller friends and my house has been open to them, but how many times have I been in conversation and interview and allowed prejudicial comments to go unchecked? Intellectually, I know that oral historians can learn more by pursuing the informant's agenda rather than their own. Emotionally and politically, I know that I should not let such comments go unchallenged. The prejudice hasn't decreased over the years; as our society has become more multi-cultural, more targets have appeared. Meanwhile the plight of the travellers seems to get worse, if anything. They are now house-bound, stuck in the worst part of our housing estates, but still suffering all the jibes that their ancestors did. The traveller families that I have contact with now through my work have none of the freedom of the road even for part of the year that their grandparents would have had, (though interestingly, they seem to want to reclaim the once-despised name of 'Gypsies' to distinguish themselves from the New-Age lot.) They are a truly immobilised underclass with only their vicious internecine family rows to keep them going. The Travelling People may be about 40 years old but its message is as punchy as ever ... but I am supposed to be looking at the work itself, rather than my reaction to the message. Of course, the programme makers had a lot to choose from. There are lots of stories about Parker's obsessiveness with diverting finances to his own projects - megalomania, some people have called it, but the facts of the matter are amazing. Lawrence Aston in his booklet notes tells us that "Despite the pressures of tighter budgets and production schedules, the team travelled extensively in England and Scotland, recording over 300 hours of 'people talking about what it meant to be a tenth-rate citizen in a civilised land'." 300 hours for one 45 minute programme! Where are the tapes now? How well have they been catalogued and indexed? How accessible are they? Are they part of the 5000 hours of reel-to-reel tapes that exist in the Charles Parker Archive in Birmingham Central Library? Well, yes, it seems that they could all be there. I was told that Charles Parker never threw anything away and that it would take a great deal of work to produce a proper index of all the papers, books, film, photographs and tapes that the archive includes. It will take years of work to catalogue it properly and at the moment the money to finance this does not exist. If anyone fancies following this up, then the archivist in charge of the Charles Parker Archive is the very helpful Sophie Popham on 0121 303 4217. One of the trustees of this archive is a familiar name: Pam Bishop, 35 Waterloo Road, Birmingham B14 7SD. Incidentally, don't try the website address given in booklet as it will give you an error message, but try: http://www.birmingham.gov.uk which brings you to an "Access" page. Choose A-Z index and then "archives" to finally get the link to the Parker archive. What is almost certain is that when this Aladdin's Cave is opened up there will be the most wonderful treasures to be found. This is not just a collection oral history reminiscences about the old ways. Ewan and Peggy had access to some of the twentieth century's most important tradition bearers and the songs, tunes, stories, lore are bound to be part and parcel of the collection. In a sense the collecting was the easy part. Much of their work must have been like Hamish Henderson's words about collecting in Blairgowrie in the late '50s. "Recording in the berryfields was like trying to hold a tin-can under the Niagara Falls." The hard work remains to be done. There are some snatches of the most wonderful stuff here, but it does bring me to a major criticism. If we listen to what sounds like a Blairgowrie traveller (sound clip) explaining hawking in her Sunday-best voice - behind the speech there is some lovely box-playing going on in the background. Who is it? It sounds to me a bit like what I remember of Toby Stewart of Ecclefechan, a distant relative of the Blairgowrie Stewarts. Let's look through the list of instrumentalists to find out who it is. Let's see: Dave Swarbrick (fiddle); Alf Edwards (concertina); Bruce Turner (clarinet) - no box player mentioned ... strange. Well, let's look at the singers listed. Who's the lovely English Romany giving us Mani Pooved the Grai? Another fine woman's voice singing Moss of Burreldale? Who is diddling? Who is giving us the Canntaireachd? It doesn't say. Belle Stewart is credited (sound clip) - but wait a minute, the penny's dropping, she is giving us the words that Ewan wrote, so she is a SINGER. Dave and Alf et al are playing Peggy's orchestration, so they are MUSICIANS. Everyone else is just unaccredited ACTUALITY. Was this good enough in 1964? Is it good enough for a current re-release? I think the answer is no in both cases. I'd like to seek out more recordings of all these people - the wonderful Aberdeenshire voice that tells such a gripping story in an arresting style. How can I, if I don't know the names of the performers? The neglect or arrogance that caused this omission aside, the whole project deserves nothing but praise. The success and durability of the best of the songs that MacColl wrote for The Radio Ballads is beyond dispute. They have already stood the test of time of up to 40 years and are still being sung. The Terror Time, The Moving-On Song, The Thirty-Foot Trailer, Freeborn Man and so on have all have taken on existences independent of their part in this programme, much loved, much sung, recorded and broadcast. Their power seems little reduced with the passing years. Ewan wasn't much noted for his humour, but the way that the settled people's attitudes are hilariously mocked in The Gypsy is a Gentleman makes one wonder why the folk revival has neglected this. The same could be said for Us or the Gorgio People where the mess of a gypsy encampment is compared with the greater mess that is being made of the wider environment. If anything, this song seems increasingly relevant with the passing years. 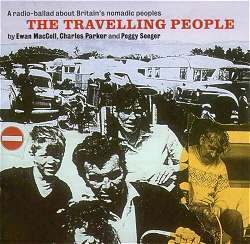 When I got to know some Scots travellers, particularly Belle Stewart, I seemed to be constantly hearing phrases from Ewan's 'Travelling People' songs coming back at me as part of their speech patterns, their everyday language. I remember being vaguely troubled by this. Was there some sort of plagiarism going on in MacColl's songwriting? I also remember sharing these thoughts with Bert Lloyd, who just gently smiled and said that he thought that it was part of Ewan's great skill that he was able to capture the common tongue so well in his songs.